On Nov. 4, the Paris Agreement on climate change entered legal force. It requires 195 nations, including the U.S., to take collective action to reduce greenhouse gas emissions and limit global temperature increases to no more than 2 degrees Celsius. The U.S. EPA has announced plans to hold a public hearing on Dec. 6 in Chicago for its proposed Renewables Enhancement and Growth Support Rule. Those who wish to testify must contact the EPA by Nov. 22. Third quarter 2016 revenue at Green Plains Inc. was $841.9 million, up from $742.8 million in the third quarter last year, said Todd Becker, Green Plains president and CEO. The company produced 292.2 million gallons of ethanol during the quarter. 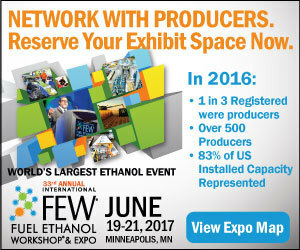 Pacific Ethanol sold a record 243.7 million gallons of ethanol during the third quarter of 2016. The increase reflected increased output from the company’s eight plants and a 16 percent increase in third-party sales over the same period in 2015. The USDA's most recently Crain Crushings and Co-Products Production report shows corn for fuel alcohol was at 435 million bushels in September, down 5 percent from August, but up 2 percent from September of the previous year. After a challenging first half 2016, Archer Daniels Midland Co. had a stronger third quarter and is positioned to finish the year with a solid financial performance, said Juan Luciano, ADM chairman and CEO. On Nov. 2, Bunge Ltd. released third quarter financial results, reporting improved results for its sugar and bioenergy segment, driven primarily by its sugarcane milling operation, which benefitted from higher sugar and ethanol prices and volumes. Scientists at the U.S. Department of Energy's National Renewable Energy Laboratory made the surprise discovery that a metabolic pathway to take up CO2 exists and functions in a microorganism capable of breaking down and fermenting cellulosic biomass. Sheetz, one of America's fastest-growing family-owned and operated convenience retailers, celebrated the impact of the USDA Biofuel Infrastructure Project Grant with the opening of its 10th E85 and E15 Biofuel station in Virginia on Oct. 26. Mexican authorities considering how ethanol fits into their country's energy mix heard from U.S. researchers about air quality, lung health and other quality of life benefits at a recent workshop hosted by Mexico's Secretariat of Energy and the USDA. Green Biologics Inc. recently announced a strategic partnership with HOC Industries, a custom blender, packager and distributor of consumer and government products, headquartered in Wichita, Kansas. The Renewable Fuels Association is hosting free ethanol safety seminars in Alabama. Two classes on Nov. 8 will be in Prattville, Alabama, and the remaining two classes on Nov. 10 will be held in Decatur, Alabama. The Export Exchange 2016 hosted 19 U.S. Grains Council trade teams, a logistical feat that is offering international guests a prime view of corn and sorghum harvest and U.S. export infrastructure in more than 15 U.S. states. Iowa has awarded $368,200 through the fourth round of the “Fueling Our Future 100” initiative to support the installation of 15 new blender pumps and three underground storage tanks that can be used to distribute higher blends of renewable fuels. A regional interdisciplinary team led by Montana State University has received $6 million to develop new innovations at the intersection of food, energy and water systems while training the next generation of scientists. Ener-Core Inc., a developer of innovative gas conversion technologies for global commercial and industrial facilities, has delivered two of its 2 MW sized power oxidizers to the Stockton biorefinery site owned by Pacific Ethanol.